In non-stick pan over medium heat, add olive oil and butter plus diced onion and garlic paste. Saute until onion is translucent - about 3-5mins. Add rice and coat well with onion and garlic. When rice starts to slightly brown add a little bit of the chicken stock. Once stock is soaked up continue to add remaining stock until fully absorbed. Add parmesan cheese to rice and turn off heat. Stir rice until cheese is combined. Poor rice into large bowl and place in fridge for 2-3 hours. Crack egg into bowl. Add about 1/3 cup of water and whisk until combined. Place flour and crumbs onto separate bowls. Mix grated mozzarella cheese and finely diced mushrooms together. Take a golf ball sized ball of the risotto mixture. Flatten in palm of hand and then add about a teaspoon of cheese/mushroom mixture. Fold rice around until cheese is covered and you have a ball shape. Dip into flour, then egg and then finally crumbs. Place arancini balls in fridge for 1 hour. To cook, deep fry the arancini in canola oil that is on a medium/high heat. Place on paper towel afterwards to absorb excess oil. For Napoli relish, saute a coarsely chopped onion in olive oil for 2-3 minutes. Now add Dolmio sauce and tinned tomatoes. Turn heat down and let simmer for 10-15 minutes or until liquid is reduced. 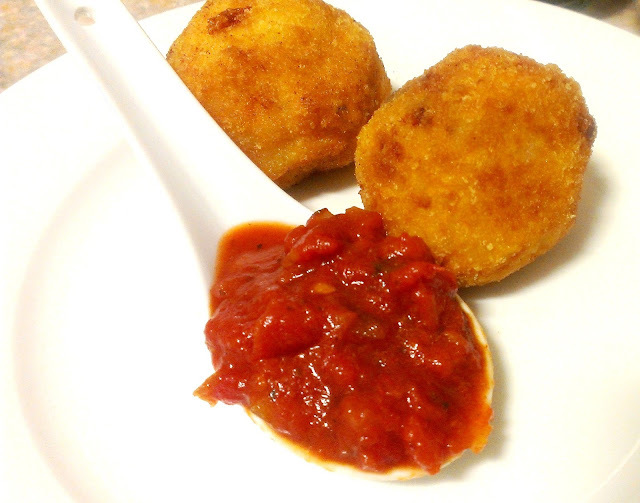 Serve on side of arancini.